The mobile VR movement has seen the introduction of an absolute barrage of cheap headsets over the last few months, all with one thing in common – they need a smartphone to power the proceedings. That's not the case with the AuraVisor, a VR headset that has just landed on Kickstarter. Rather than using a mobile phone in the engine room, the AuraVisor has its own hardware built in. There's a quad-core 1.8GHz CPU on board, along with a Mali GPU and 16GB of storage – which is expandable with an microSD card. The visuals are provided by a 5-inch OLED display – 1080p in each eye – and a 100-degree field-of-view. Essentially, it's a mobile VR headset with the mobile built in, running Android and therefore able to tap into the wealth of Cardboard apps and 360-degree YouTube videos. Wi-Fi is on board, as is Bluetooth, so there's no need to tether and you can pair it up with control pads and headphones. What's more, the AuroVisor has a HDMI-in port, so you can use it as a monitor for anything of your choosing – PC, Mac, Xbox, PS4, Blu-ray player and so on. Just why you'd want to sit in a virtual theatre watching your 2D content (albeit stereoscopically upgraded to '3D') is beyond us. But the option is there. "The AuraVisor has the potential to do to virtual reality what the Model T Ford did to transport, the Atari 2600 did to home gaming and the camcorder did to home movies," said James Talbot, AuraVisor co-founder. 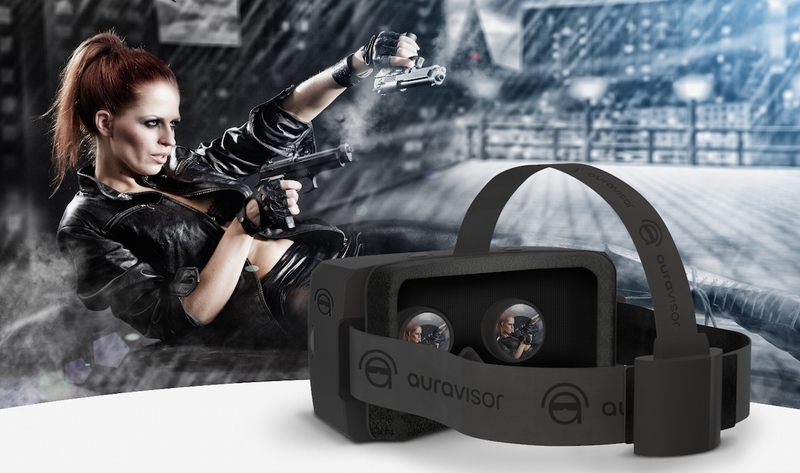 "Because AuraVisor has been designed from the ground up to specifically function as VR, the initial set up is quick and simple and the graphics do not pixelate. The headset does not suffer from noticeable latency or lagging issues as you move your head freely." We must admit it's a neat idea and, if the cost is more budget than premium, it could well be one of the easiest tickets to the VR roadshow. The British company behind the headset are looking for £100,000 in funding – £135 gets you one. It's going to cost £300 when it comes out in the real world, which is too much in our opinion. It needs to stay south of £200 to compete with truly budget Cardboard sets and Samsung's cheaper and cheaper Gear VR range.